If you have or ever thought of having a water garden or pond and worry that it is not a good time because of the water shortage – think again. Now more than ever a pond is a great idea, especially in drought ridden areas like Southern California. Most would be surprised to know that ponds use far less water than a lawn or garden. The same water is recirculating over and over again. Then when you do need to clean the filters or change some of the water out it can be used elsewhere in the yard. So you would be recycling as well. Then when you add new water it will only be to top it off from time to time. Now that being said, it is a must to choose the best possible pond builder. But how is that possible? A referral is a good idea. Your neighborhood pond supply company? May be. Are you a State Licensed Contractor? Do you understand the needs of Koi and aquatic plants? Are you well educated on different pond equipment like U.V.s, pond pumps and pond filters? Do you having any special training like being a Certified Aquascape Contractor? Ask to see other ponds that they have built. Make sure they ask and understand what you are expecting from their new yard centerpiece. Now more than ever you need water in your garden. Animals and birds who have been displaced for the lack of water will be appreciative of your water oasis. Article: Can I have a pond during a water shortage? 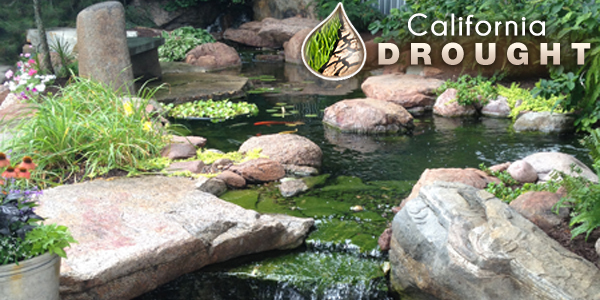 Pacific Ponds >> Pond News >> Aquascape >> Can I have a pond during a water shortage?